U.S. stock futures for Tuesday, June 16, forecasted a 52-point decline from yesterday's close. On Monday, the Dow Jones Industrial Average fell more than 107 points as investors sold on fears and frustration over Greece's inability to address its debt obligations. 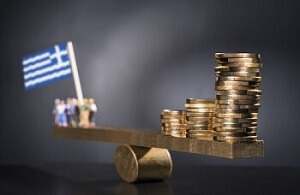 Over the weekend, Greece and its creditors failed to fashion an agreement ensuring the nation could meet its debt payments to the International Monetary Fund. The news sent global markets tumbling and has investors on high alert over Europe's economic future. Monday's largest decliner on the Nasdaq and the S&P 500 was Microsoft Corp. (Nasdaq: MSFT), which slipped 1.1%. The Stock Market Today: The Fed Open Market Committee begins its two-day session on monetary policy this morning. Investors will be on edge until tomorrow's statement by Fed Chair Janet Yellen on the timing of a potential interest rate hike. The Fed said it will only raise rates when its members feel there has been strong improvement in the economy; however, we have heard statements from several FOMC members who appear to be suffering from Zero Interest Rate Policy (ZIRP) fatigue and want the central bank to take action sooner than later. Failure in Focus: Problems with Greece continued to accelerate this morning. European stocks were hovering near four-month lows as global markets began to brace for the strong possibility Greece will default on its debt. The Greek Finance Minister Yanis Varoufakis said his country has not prepared any new proposals to meet its debt obligations. Oil Outlook: Oil prices were in focus this morning as Texas and oil platforms in the Gulf of Mexico were bracing for a tropical storm. WTI crude futures for July ticked up 0.5% this morning to $59.84 per barrel. Meanwhile, Brent oil was flat today at $63.95 per barrel. Pre-Market Movers No. 1, ADBE: Software giant Adobe Systems Inc. (Nasdaq: ADBE) will report second-quarter earnings today. Investors are anxious to see the company's progress as it shifts its sales strategy from traditional box licenses to web-based subscriptions for its Creative Cloud software bundle. The goal of the subscription model is to boost a predictable revenue stream, which could eventually allow the company to pay a dividend. Shares were up 0.1% in premarket hours. Pre-Market Movers No. 2, GPS: Shares of Gap Inc. (NYSE: GPS) were slightly up this morning on news the apparel retailer will close more than 175 stores and slash 250 jobs at its San Francisco headquarters. Analysts say the company's fashion releases are not registering with customers, who are instead turning to rivals. The news follows a series of recent management changes. Pre-Market Movers No. 3, AAVL: Shares Avalanche Biotechnologies Inc. (Nasdaq: AAVL) cratered more than 48% this morning on news the eye drug company's experimental treatments failed to improve vision in Phase II trial patients. The stock plunged after a number of analysts slashed ratings and stock forecasts for 2015 and beyond. Stocks to Watch No. 1, BABA: Shares of Alibaba Group Holding Ltd. (NYSE: BABA) were down marginally this morning after the company reported it's planning to invest roughly $500 million in Snapdeal.com. The news comes a day after the company reported plans to introduce its own video-streaming division in China with executives saying they planned to become the domestic version of Home Box Office (HBO) or Netflix Inc. (Nasdaq: NFLX) over the long term. Stocks to Watch No. 2, RYL: Shares of Ryland Group Inc. (NYSE: RYL) were up more than 1% this morning, a day after jumping 5.2% on news the housing company will merge with West Coast rival Standard Pacific Corp. (NYSE: SPF). The $5.2 billion merger will create the nation's fourth-largest domestic homebuilder after D.R. Horton Inc. (NYSE: DHI), Lennar Corp. (NYSE: LEN), and PulteGroup Inc. (NYSE: PHM). Housing stocks are in focus today after U.S. housing declined 11% in May, while construction permits increased by 11.8%.